As the 1960s ended the Marquis editors took stock of their library of publications. To complement the flagship Who’s Who in America, a variety of titles had been added over the years: the Who Was Who in America series, Who’s Who of American Women, Who’s Who in Finance and Industry, and the four titles covering the regions of the United States. Now the editors determined it was time to take on the challenging task of covering the biographical achievements of prominent individuals the world over. 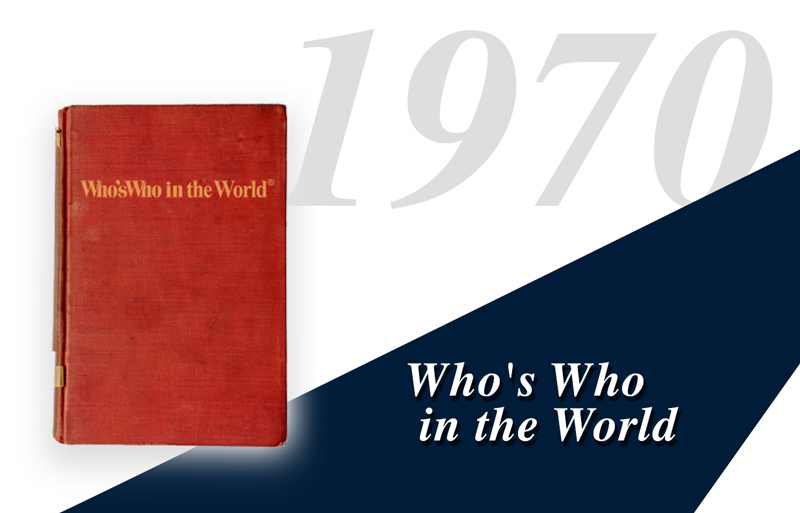 The result is the first edition of Who’s Who in the World, which contains the biographies of approximately 25,000 luminaries from over 170 countries. Included are all Heads of State and other pre-eminent figures, prominent figures from business, top scientists, and chief ecclesiastics of the larger religious denominations, to name only a few.